I finally have a couple pictures of my cage rack and cages inspired by your directions! I built it out of square hollow section with a reasonable wall thickness, all welded together. It still has a way to go, I don't have racks or anything in, but I did put it in place, put a cage in, and install a "test-bunny" tonight. I'll try to get a better pic when it is finished. Can't think of all the dimensions at the moment, but it is only about 2 feet from the ground, which means I will probably have to pull out the bottom cages to rake out the poo, but I figure when it needs raking is probably a good time to clean the cages thoroughly too. And as it is, the top cages are pretty high for me, since I'm short. I put it about 1.5 feet from the fence, would that be enough space for the stuff to fall from the top rack and not hit the fence? I don't want to rust the fence out, but I also need to keep a reasonable width laneway! For the tray I am looking to use ply with a layer of core flute (I think you guys call it coroflex?) over the top, so that is why I have the angle steel to support the tray. The cages I've made are about 40" x 24" x 20". Hopefully the sizes are okay for mini-lops (your holland lops). And with the extra height I will put in a shelf inside the cages. There is a fair space gap either side of the cages to allow hanging a hay rake to the sides. In the pic you will see the plastic container, we use these for *everything! * We make buckets, chook nests, chook water troughs, rabbit hay racks, etc. I put one in for the test bunny because I don't have shadecloth around this area yet and it is still pretty cool. Hopefully she will nestle down into it and be okay. She has just been evicted from the house because she has started to spray everywhere, naughty bun. I try to raise youngsters inside because I get them out and play with them more, especially winter when I don't want to be outside after work! Let me know what you think of what we have built! I don't know if you'll see this, Michelle, but I'm interested to know where you found 14 gauge wire in Australia. 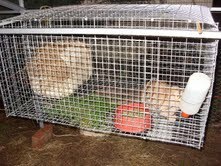 I'm in the UK and can't find it anywhere -- not in the desirable mesh size of 1/2" x 1" for rabbit cage floors. Can't even find 16 gauge (1.2mm) in that small a mesh size. Can't find the stuff in France, either, where they appear to be perfectly happy to build rabbit cages entirely out of 0.7mm cage wire! Which must be, what, 20g?(!) ...Sigh. There are good deals to be had on shipping between Australia and the UK so I was looking for wire mesh on online sites in Oz today, but no joy. Nice...!! Looks great. I have some metal frameworks too, but they're angle iron, and I don't think as strong as the framework you've made. I'm finding that with a 6 foot span, the angle iron tends to sag a bit in the middle. But the good part is - I can disassemble and reassemble to reduce the width of the span and hopefully eliminate the sagging. It doesn't look like you'll have any problem with this - your welded metal tubes look bomb-proof. The only advantage PVC has over your frame that I can see is portability. But, if you have no plans to relocate, your set up is excellent. Maybe other visitors will offer their opinions as well. Thank you very much for sharing with Raising-Rabbits, and yeah, we'd love to see an updated photo, if you'd like to send it.